On April 1, 1919, a group of 94 farmers near Cabot, VT, came together sharing one thought – working together they could remain strong. They envisioned and worked toward laying the foundation for a cooperative of farmers sharing all of the profits made from their products. They would form what was then known as Cabot Farmers Cooperative Creamery. The original plant carried an investment of $3,700, which each of the member farmers contributed to in accordance with the number of cows they owned. Only two of these original farmers, Angus Smith and H.L. Nelson, owned more than 30 cows, but combined there were 863 cows among them. Each farmer in the beginning also provided firewood for the plant. 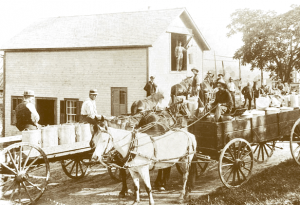 During its early days, Cabot Creamery made butter with its excess milk. In 1930, the co-op decided to start making cheese. The cooperative has operated to this day using the Rochdale Principles. Here, cooperative economics, workplace and employee treatment, management, education and training are focused on. Cabot Creamery is B Corp certified, being the first dairy cooperative to achieve this recognition. This achievement is given to companies that redefine success in business. Cabot has faced many changes through the years. A former employee who was hired in 1959, Oscar Woods, said that Cabot used to make butter under the Rosedale brand. He was told they used to make their one-pound butter with a wood frame that had inside it a print that stamped the Rosedale logo on the top. It would then be put into parchment paper and wrapped for shipping. He said this was all done by hand. Woods also said he remembers the old vats having wooden sides sheeted on the inside with stainless steel that came up over the top and were nailed to the wood. They used to measure the weight in “jugs” – a cream can held 86 pounds of milk. They knew that each vat held 100 jugs per vat. Modern vats are completely made of stainless steel, with the weight figured in pounds and everything computerized. The manufacturing plant in the town of Cabot grew off from the original building. What is now call the lower plant sits on what was the original building site, that itself having at one point been reconstructed, the rest having been constructed from it. They once used a dock near the road connected to the lower plant where private haulers would unload cream cans. The same dock was used when the milk was hauled to the creamery on horse-drawn wagons. From there they were set on a metal track that would slide the stainless steel cans to a tank. This tank had a scale that weighed the milk. The cans were set into a can washer where they were cleaned by a jet stream of hot water and then a burst of hot steam. The next morning the driver would go back to the farms and exchange the empty cream cans for full ones. Woods said “these were rugged people,” as he recalled the milk haulers picking up these full cream cans of milk, one in each hand, as they carried them from the flatbed of the truck onto the dock and then onto the track. In 1988, a large plant up the hill from the Cabot Manufacturing Plant was built for the cut and wrap – a distance of about 500 feet rather than the 20 or so miles from Morrisville. 1992 brought the largest management change for the company. In that year, the co-op decided to partner with AgriMark, a cooperative based in Massachusetts. This brought with it the cooperation of the Chateaugay, NY, plant and the Springfield, MA, plant. There is also a plant in Middlebury, VT.
Aside from production plants, Cabot has a visitor center connected to the home manufacturing plant in Cabot. There are several annex centers. In 2007, the cooperative started marketing internationally. Cabot markets their many dairy products – which include cheese, butter, yogurt, sour cream, cottage cheese, cream cheese and dip – to all 50 states and 22 countries. My employment at Cabot Creamery started in October 2008 at the cut and wrap plant. At that time, 400 of Cabot’s member farms were in Vermont. According to Cabot’s website, there are now 800 member farms. Cabot has been a large economic driver for northern and central Vermont since its inception. In total, the creamery has over 1,000 employees. Much has happened at Cabot Creamery in the decade I have worked there. In 2008, the magazine Wine Spectator listed Cabot Cloth Bound cheese as one of the “100 great cheeses of the world.” That same year, Cabot Monterey Jack received an award from the American Cheese Society. Cabot cheddar is the most awarded in the country. The Springfield plant recently expanded by constructing a new dryer for the production of milk powder. Of the 94 dairy farms that started the cooperative, only one remains – the McDonald Farm in Danville, VT, within 15 miles of the original plant, now operated by James Beattie. The McDonald Farm operates a herd of 110 milking Holsteins and Jerseys on 330 acres. Beattie said Alexander McDonald was his ancestor that “came over on the boat” and his son John established their farm in Danville in 1839. Beattie said his children make the seventh generation on the farm. The home plant in Cabot came under new management in 2018. Jeannette Cole is the vice president of operations, coming from Green Mountain Coffee Roasters in Waterbury, VT. Cole said she is excited about all the growth opportunities within the industry. She is also looking forward to helping improve processes that come together to keep the workplace safe, sustainable and efficient. Cole said she appreciates employee input about ideas to help improve the plants’ functions. Every single day for the last 100 years thousands have done their part in bringing from dairy parlor to store shelf a quality product. From feeding the calf to milking her when she grows and from transferring milk to the vat to wrapping the pallet for shipping, that this has taken endurance, patience, resilience, dedication, strength and durability on the part of all who were ever involved.